It will be interesting to see how the whole trial turns out to be. But he kinda ruined his post by saying that he would just get the rights and finish the game… He can’t even properly finish his own games. The worst he could do is to ‘kick everyone out’… Even if they are working slow af (and progress is measurable, though miniscule, in that game), those people have the knowledge of the inner workings of the game, engine etc. There probably wont be any proper dev documentation (or comments) of their software either, so kicking them all out would leave him with a coding nightmare. Good luck finishing that. Him saying that they’re pretty much insolvent means nothing, as he’s been saying the same thing pretty much since about… 6 months into the development? The long and short of this is that CIG/RSI are facing a very serious issue that could have long-term ramifications. That they could even hope to settle this for less than $20M, is a pipe-dream; unless of course CryTek are desperate and willing to take whatever they can, plus attorney fees. Even with the punitive damages temporarily off the table – assuming they don’t re-file as per the judge’s suggestion (bottom of last page in the filing) – the breach in Section 2.4 alone is already a major slam dunk. Combining that with copyright infringement as it pertains to SQ42 being a separate game, the damages go through the roof. For context and comparison (and that was back in 2012), Epic Games won massive damages (later doubled!) against Silicon Knights, and bankrupted the company in the end. And they took advantage of the injunctive relief, forcing SK – via court order – to remove and destroy all their products from market. That’s how bad this is. That we’re in 2018, where new precedent for damages have been set and won, well you can guess the rest. Not sure he’s ever been right. Well, if you make enough shot in the dark predictions, some of them are going to be correct eventually. BREAKING! Crytek have now filed a second amended complaint that solidifies their claims. They specifically went for what I wrote that they would as per 2.4. It’s funny - and I’m not even a lawyer. Thread by @dsmart: "BREAKING! Crytek have now filed a second amended complaint that solidifies their claims. They specifically went for wthey would as per 2.4. It's funny - and I'm not even a lawyer. I will have more in a bit. docdroid.net/X4V […]"
Proud trying to stop the ship sinking. Or prideful he is still sinking the ship. Eventually. If he reloads enough times. He’s been saying SC is a scam for a long time. Yet he’s never really got the “scam” part right. Have the backers been scammed? I wouldn’t say yes. But clearly CryTek was. Though we do finally have an answer to the question “why CryEngine?” The reason was CryTek was the only company that would let CR use their engine. Not only that, but they did a lot of work (if not the vast majority) on the original crowdfunding launch tech demo. Though I still have questions. Like who paid for the digital assets used? People would say “CR is/was rich!” Yeah, was. At one point. But he was clearly looking for a job and no one was hiring. My guess is that either CryTek or someone else fronted the money for the digital art. Next question, when did they make the tech demo. CR was quoted that work on the game was going on at least a year and up to 18 months before crowdfunding started. It’s known that in 2011 CR pitched an idea of a new Wing Commander. I wonder if the art assets and maybe even the trailer itself was originally made for that? Though one thing is clear, “Roberts Space Industries” and “Could Imperium Games” didn’t actually start working on Star Citzen/SQ42 until a month or two after the crowdfunding campaign. And when I say work I mean on actual code, not lore, etc. How many times does that Guy post per day? I know he has his own issues. But this is to the point of obsession for him. He’s my sole source for star citizen news so I appreachiate it a lot. 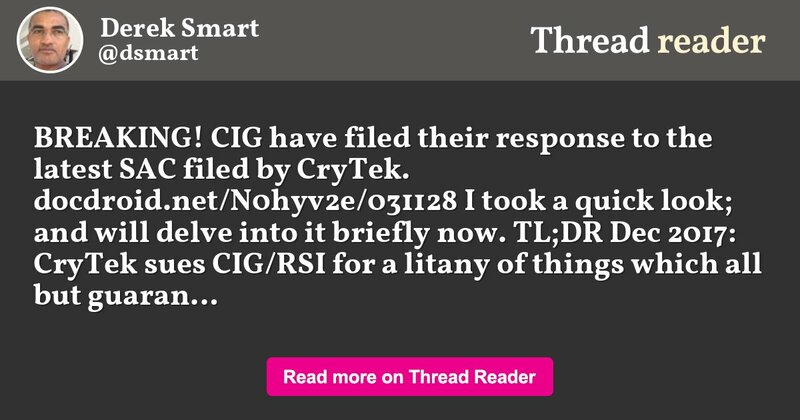 CIG, not waiting for their 20 day period, have immediately filed a response to Crytek. Not sure why they’re so afraid of discovery. It’s weird. Almost as if they’re trying to hide something. His own games aren’t gonna get him any attention so he has to do something. True and they they are not making him money.The severs have shut down for both of the MMOs that he owns. Would not be surprised if he was in debt by a large margin. He is more than wealthy and is set up for life ( he got millions off a lawsuit which he reinvested ), he does not care if his games turn a profit or not. Infamous indie developer Derek Smart talks to Polygon about fear, regret and his latest game, Line of Defense. I really doubt that number is accurate by a long shot. But if it is. He is not doing a good job at protecting his investments. No idea how accurate this number is. But the guy has acquired companies / games, ran and funded his own games ( with a dozen developers ) on himself for 15+ years, there’s no way he didn’t have a good amount of wealth at some point. True - He had to have had some wealth at some point to do such things. Anyway - I really do not want to talk about him anymore. Chris Roberts and CIG and the whole project are in big trouble now. There are no cash reserves, we see this by all the loans he recently took out. No bank will lend him money after this recent court ruling. And discovery of the financials may well proceed now by CryTek so its all out in the open. DS could well be correct when he says we might wake up one day to find CryTek owns everything. And kicked CR out on his arse. To settle this case by using backer money would be the final betrayal by CR. For a mess he alone created, by bad mismanagement of the project and utter greed. Getting sued is costly. 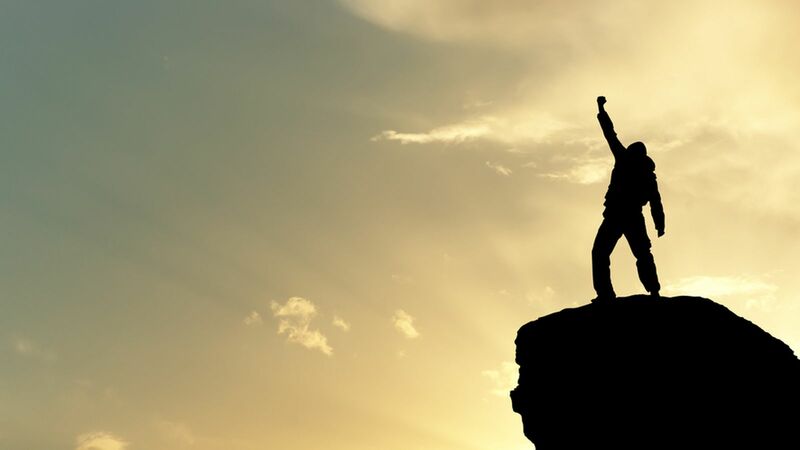 You dont need to be nearly bankrupt to not want to spend money on defending against a lawsuit, even if you are certain, that it will end with you winning. Trying to get the lawsuit dismissed is standard course of action for pretty much every lawsuit which could potentially publicise your company’s secrets (which financial data are certainly a part of). 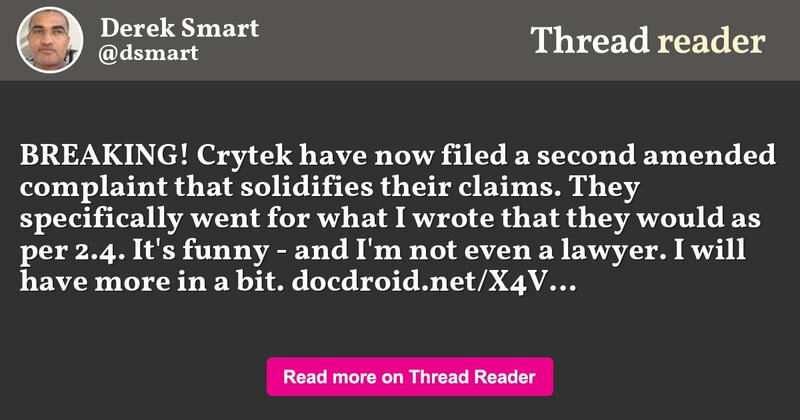 So hold your enthusiasm until crytek actually wins the lawsuit. Otherwise you might wake up and be utterly disappointed by cig not being a burning carcass.